We would like to recognize the JPMCC’s and GCARD’s sponsors and partners. The Global Commodities Applied Research Digest (GCARD) is supported by a generous grant from the CME Group Foundation. The JPMCC’s Advisory Council consists of members of the business community who provide guidance and financial support for the activities of the JPMCC, including unique opportunities for students. The JPMCC’s Advisory Council members are as follows (in alphabetical order): Ardent Mills LLC, Blacklight Research LLC, CME Group, CoBank, Encana, Fonterra Co-Operative Group Limited, FourPoint Energy LLC, J.P. Morgan, Newmont Mining Corporation, Razor Commodity Advisors, LLC, Robert Bosch GmbH, Trinidad Bentham Corp., Uniper Global Commodities, and Xcel Energy. The Director of the Energy and Commodity Finance Research Center (ECOMFIN) at the ESSEC Business School (France, Singapore) serves on the GCARD’s Editorial Advisory Board. The GCARD’s professional society partners are the International Association for Quantitative Finance (IAQF) and the Chartered Alternative Investment Analyst (CAIA) Association. The IAQF is a not-for-profit, professional society dedicated to fostering the profession of quantitative finance by providing platforms to discuss cutting-edge and pivotal issues in the field. The CAIA Association, in turn, is a non-profit organization that is a world leader in alternative investment education and is best known for the CAIA Charter®, which is an internationally recognized credential granted upon successful completion of a rigorous two-level exam series, combined with relevant work experience. 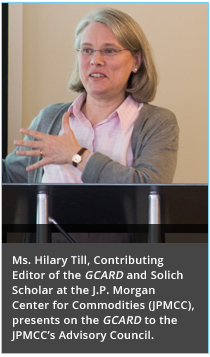 The Contributing Editor of the GCARD serves on the IAQF’s Board of Directors and also on CAIA Chicago’s steering committee.